dark sand, while perfect shells!! WOW, WHAT A GREAT SHOT. THE DEEP COLORS AND MOTION FROM THE WAVES ARE REALLY INTERESTING. HAPPY WW! Nindot ang kuha! !taga Cebu ka day? happy WW! Happy WW and Happy Halloween! Gorgeous shot. I love how most of the shells are just shimmers in the sand. What a gorgeous shot! Happy Halloween and Happy WW! that is beautiful!! Happy WW. This shot was taken at Baybay beach, our city's main beach. 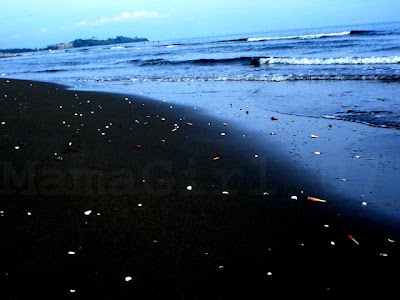 The sand is greyish-black and every morning, as in very early morning, you will see lots of shells washed ashore. Thanks everyone for dropping by! Hope your halloween was a great fun! Hi Mamagirl...wow it is very nice shot...by the way i am from baybay city....where part in baybay that you taken that photo?